The idea of preparing homemade tortillas may seem a little overwhelming at first, but you will quickly realize that making your homemade tortillas is not all that difficult. Plus, the results are far superior to the thin, dry tortillas you will find packaged in the grocery stores. 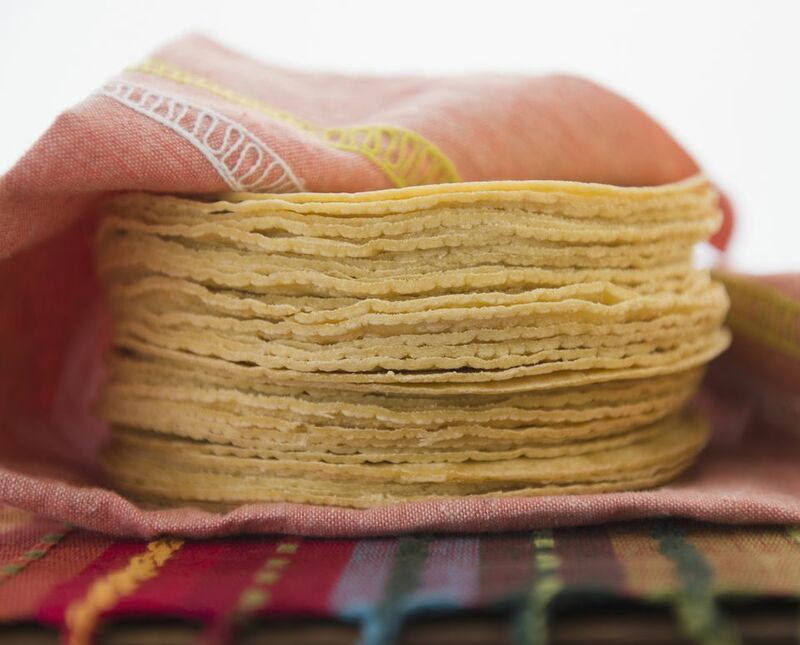 This recipe for homemade corn tortillas uses only three ingredients: water, baking powder, and masa harina which is a special cornmeal treated for lime appropriate for making tortillas. None of these ingredients are especially high in calories, so go ahead and enjoy a few as part of a healthy low-calorie diet. To begin, place the masa harina in a large bowl. Sprinkle in the baking powder, and use a fork to toss together the mixture well. Next, you will add the warm water. Make sure that the water is not too hot. It should feel warm to the touch, but not hot enough to be uncomfortable. Use a spoon or fork to begin mixing the water into the masa harina mixture until the mixture becomes too thick to continue mixing with a utensil. Then, use your hands to mix and knead the dough several times until it forms into a soft ball. Next, you will divide the dough into twelve portions for the twelve tortillas. To do this, tear off a small portion of the dough, and roll it between the palms of your hands until you form it into a ball about the size of a golf ball. Place the rolled ball of dough on a baking sheet or pan while you roll the remaining dough, and cover with a damp towel or plastic wrap to keep the dough from drying out. If the dough dries, it will become crumbly when you try to roll it out. Repeat this procedure until you have formed twelve balls. Place a cast iron skillet over medium heat. While the pan is heating, begin rolling out your first tortilla. There does exist a certain kitchen gadget called a tortilla press that makes quick work of this process. However, if you do not have a tortilla press, you can easily roll out the tortillas by hand. Collect two large plastic sandwich bags and lay them flat. Place one of the rolled balls of dough on the middle of one of the sandwich bags, and cover it with the other. Place a large, round, flat surface on top of the top plastic bag (We use a round cake pan) and press the dough into a flat circle with about a 6-inch diameter. Peel the pressed tortilla from the plastic bags, and place it in the hot cast iron skillet. Cook the tortilla for 45 seconds to one minute on each side, until it is no longer doughy. Place the cooked tortilla on a plate, and cover with a damp towel to keep from drying out. Continue the process to cook the remaining tortillas. If you feel comfortable enough with the process, you can quickly roll out one tortilla at a time while the previous tortilla is cooking in the pan. Just be sure to keep an eye on the tortilla cooking in the skillet to be sure it does not burn.